The blogger Ian Silvera has processed the data of how many interns are employed, for free, by politicians. 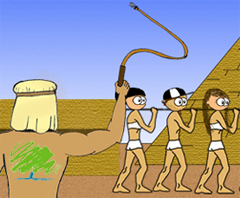 Bad news for the Tories this morning as it emerges that the practice of exploiting slave labour goes to the very top of government. The worst offender by far is Jeremy Hunt, who has taken on seven unpaid interns in the last year. Mark Harper, Dominic Grieve and Andrew Mitchell have had three recreational bag-carriers a piece, while other members of the Cabinet, including Lansley, Gillan, and Greening have all recruited gratis support. Once CCHQ and the backbenchers are also scrutinised, the number of unpaid interns the Tories have used in the last year is at least 125. And they were the ones that were merely advertised rather than auctioned! Multi-millionaire Jeremy Hunt, Cabinet minister's salary £134,565, paid himself £2 million bonus last year. Total pay to 7 interns: £0.00.